Reviews for: The Best Little Grammar Book Ever! : Speak and Write with Confidence / Avoid Common Mistakes 2nd Edition, by Arlene Miller. Joel Friedlander reviews The Best Little Grammar Book Ever! In this delightful book, Arlene Miller demystifies the basics of grammar to help you communicate with more clarity. And she does it without talking down to the reader, and without boring you to tears. This is not a compendium of grammar practice; it’s a streamlined overview with lots of tips and hints that will have you writing better right away. Joel Friedlander is an award-winning book designer, a blogger, the author of A Self-Publisher’s Companion: Expert Advice for Authors Who Want to Publish and The Self-Publisher’s Ultimate Resource Guide. He’s been launching the careers of self-publishers since 1994 and writes TheBookDesigner.com, a popular blog on book design, book marketing and the future of the book. 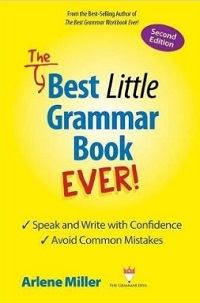 Sheri Graves reviews The Best Little Grammar Book Ever! This Second Edition of Arlene Miller’s Best Little Grammar Book Ever is highly recommended for students, teachers, writers and anyone else who wants to produce written material that won’t make intelligent people laugh at idiocy. There is a reason Miller is called “The Grammar Diva.” In simple, easy-to-understand terms, Miller explains grammar rules and how to negotiate the world of written language. Not only that, she has a sense of humor that holds the reader’s interest from one page to the next. She is a former teacher, a well-known speaker on the subject and a best-selling author on grammar. There is no better grammar guide to have in your bookcase or briefcase. Her other grammar books also are worthwhile for anyone who is serious about the written word. Sheri Graves has been writing for publication more than five decades. Her debut novel, Deep Doo-Doo, published in October 2014, is the Crime Fiction winner of the 2015 National Indie Excellence Awards. Two sequels are in the works. She received numerous awards for journalism excellence and retired from The Press Democrat in December 2004 after 42+ years with the newspaper. The Santa Rosa woman also teaches memoir writing and has a Memoir Writing Blog.